Still from “Formation”, a reference to Storyville, the red light district in New Orleans. One week after Beyoncé ‘s newest single and music video “Formation” was dropped, voices from across the aethernets are still buzzing. The video collapses historical linear time, unapologetic and demanding in its visual college of the complicated history of southern US black culture. It is not steampunk, but engages in the historical narrative in the tradition of other African diasporic art movements I admire, such as afrofuturism and steamfunk, and deserves to be highlighted. “Formation”‘s launch is deliberately-timed for powerful political, commercial, and mainstream impact: released on Trayvon Martin’s birthday and two days before Sandra Bland’s, and also before Beyoncé’s planned performance at the SuperBowl. Many commentators, black and non-black alike, have taken to the task of analyzing and critiquing the levels of meaning behind it. Below are some of the many insightful, dynamic viewpoints from the black community written over the past week. If these aren’t your experiences, references or reactions, that’s okay. And if this video didn’t give you life, that’s okay too. But if these aren’t your experiences and you’re out here saying any variation of “this video makes no sense/is dumb/kinda scary,” “she’s not even singing,” “Beyoncé fans are stupid,” “what’s she even saying?” or anything that has anything to do with a politics of respectability, then you need to stop. We know that Beyoncé isn’t necessarily our Black Feminist Hero – there are way too many activists and folk who are out there fighting, supporting, and holding together Black communities for us to be under the simplistic illusion that Beyoncé does all of that for us. And I look forward to all the juicy Black folk critiques – because nothing is Blacker than reading and being read. Beyoncé said “I’ma make me a world.” She conjured New Orleans’ past, present, and future, calling upon the memories and sounds of New Orleans pre- and post Hurricane Katrina. Because rule number 1 in the south is that the past is always present and the past and present is always future. Still shots of preaching reverends, half-drowned buildings, the weave shop, and plantation houses against a sparse synthesizer that sounds like a tweaked electronic banjo from the Bayou sonically position Beyoncé squarely in the middle of a messy Black South. Katrina is not just a historical event. It is a springboard for re-rendering southern trauma and its association with blackness. Trauma is the spring board of southern blackness. But its foundation is resilience and creativity. Beyoncé’s New Orleans – because there are multiple New Orleans and this one is undeniably hers and her sister Solange’s rendering/conjuring – doubly signifies resurrection and the city of the dead. This could have all been different, Beyoncé. The disconnect between what is being said in “Formation” and what is being shown cannot be ignored. You inspire while you slay, but know that all of the glorious Blackness in this video is really just a film reel for a sound bite espousing Western capitalist ideology with lines like, and “Earned all this money but they never take the country out me.” Even in showing me how down with the struggle you might be, you are still dredging up images of Black suffering without forewarning an audience that continues to be marginalized in both their city and country or following through by critically engaging with those images. Your anthem doesn’t match your outfit. You might get me to turn up at a party, but you’ll only find me in formation when your words and actions line up. During Jim Crow, Black people could pick up food at establishments that served white people, but they often could not eat in them. When custom demanded that Black people be served separately from whites, they were often required to have their own utensils, serving dishes, and condiments. So it was customary for Black families who were traveling to carry everything they might possibly need so that (with the help of the Green Book, the guide that helped Black travelers eat, sleep, and move as safely as possible) they could navigate America in relative comfort. But, this movement is all about self-identified Black queer women, transwomen and genderqueer folks leading this movement. So, in some ways this call ignores that, a movement already established. I know folks say it calls attention to it, but it feels just the opposite to me when we have a full fledged movement happening that is full of leaders, actually, predominately led by Black queer women, transfolk and our allies. Just look at the leadership in almost every BLM chapter: Chicago (BYP), Minneapolis, Oakland, Los Angeles. The “ladies” are already in formation, leading the work. So, though this may be a “nod,” a recognition as many are suggesting, the explicit acknowledgement of the queer work in this movement–the queerness of strategy, tactic, and focus–is muddied by the safe position that Beyonce continues to occupy. And while she is being targeted in some ways (I’ll say more when endorsements/collaborations start to fall), can we put that into context of the everyday targeting that Black Lives Matter activists face on the front lines? That Black queer (cis and trans) women and transmen face everyday? “Formation” is an homage to and recognition of the werk of the “punks, bulldaggers, and welfare queens” in these southern streets and parking lots, in these second lines, in these chocolate cities and neighborhoods, in front of these bands and drumlines. Movements for black liberation are led by black folks at the margins who know we must all get free to sink that car. Folks who know that we must be coordinated, and we must slay. And because I recognize black southern country fence-jumping feminism as a birthright and imperative, I have no tolerance for the uncoordinated–those who cannot dance and move for black queer liberation, black trans liberation, black women’s liberation, at all intersections. Black Lives Matter is rooted in some of these fundamental principles. We have come together to fight back against anti-black racism and state-sanctioned violence, in all forms. We are complex, multi-faceted, and led by what are still unfortunately considered to be non-traditional leaders: folks who are women, queer, trans, disabled, immigrant, incarcerated and formerly incarcerated, poor and working class, Southern and rural, urban and coastal. We are comprised of the complexity of who black people are, not just in the U.S., but around the world. 21. Beyoncé is a logo. Beyoncé is a commodity. Beyoncé is a production. Beyoncé is a distraction. Beyoncé is a ruse. Beyoncé does not actually exist. 22. You–not her–are the Black visionary, the budding potential for revolution. Long train of flares under piercing stars. I stand watching the steamliners roll by. That’s the first stanza of “Caravan,” the opening track of Clockwork Angels, the new album from rock supergroup Rush – introducing listeners to the steampunk land of Albion. The concept album tells a fantasy adventure of a young man’s journey across a landscape filled with mechanical contraptions, alchemical coldfire, steamliners, lost cities, a strange carnival, pirates, a rigid Watchmaker and a “freedom extremist” who called himself the Anarchist. In a groundbreaking crossover project, I wrote the novel of Clockwork Angels in close collaboration with Neil Peart, the lyricist and drummer for Rush. The twelve songs give snapshots of the story, like scenes in a movie trailer; but music is different from prose, and there was so much more to tell, and the characters and settings needed room to grow. Frontier stories are complicated ones, partly because they occur at the cultural crossroads of the world. Settlers and the places where they live are cast in narratives as either dens of adventure for independent thrill-seekers, or as an ominous presence populated by self-centered opportunists (usually white and Western, and often male) with colonial intents. 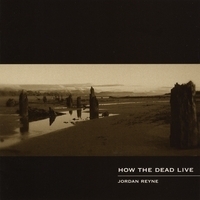 What becomes lost are the lived-in experiences from those excluded from these tales: in this case, the story of Susannah Hawes, the focal character in Jordan Reyne’s concept album How the Dead Live. The title for this article is from the album’s first song “From Gravesend,” and aptly describes Susannah’s position as a New Zealand settler in the nineteenth century. Though her circumstances as a settler had political and economic ramifications, her perspective doesn’t belong in either camp of the adventurer or the conqueror. Instead, Susannah is simply there, alone and isolated, fearful of the land she has chosen to live in. In this sense, she is a lonely immigrant in a world in which she doesn’t quite belong, one that seems as frightening as the roaring violent sea she watches from her home. Jordan Reyne’s music has been described as “antipodean steampunk” and with good reason: she uses found noises from 19th-century factories and integrates them into her music. The creaks, clanks, and hisses add a layer of roughness to her elegant songs, like grit that gets into a factory hand’s clothes at the end of the day. Her voice and style reminds me of Tori Amos, and like Amos’ work, How the Dead Live evokes the sense of quiet dread and wonderment as a woman seeks out a new life, knowing that her presence is insignificant to History and feeling Death’s whisper in the wind. Dark stuff indeed, but beautiful as well. After the jump, Jordan and I talk about the inspirations for her music, the difference between “dark folk” and “folk noir” and playing concerts on Second Life. In exploring the range of music that has been classified under the steampunk umbrella, Psyche Corporation would be on the more Gothic side of the spectrum. The one-woman musical singer behind the band, Psyche Chimère possesses a versatile voice, and her music ranges as far as the imaginative topics she sings about. At turns Psyche Corporation moves from evocative and theatrical, as with“Part of Her Design” or “Beast”; to the darkwave dance beats of “Institute” or “The Crime”; to whimsical but edgy storytelling like in “The Ceiling” and “Wonderland.” (You can listen to her music on her MySpace, Reverbnation, or last.fm). Psyche Corporation’s music, however, has struck a chord with the steampunk community, and she has performed at steampunk events around the country, including The Steampunk World’s Fair in New Jersey, Dorian’s Parlor in Philadelphia, the Steampunk Salon run by the Brooklyn Indie Mart, and in conjunction with Steampunk Canada & the Toronto Steampunk Society for Canada’s Fan Expo. Psyche Corporation’s next steampunk performance will be at The Anachronism at Webster Hall in New York City on November 21st. Just in time for Halloween, however, Psyche Chimère stopped by the blog to talk about her darkly-tinged music and her career as a musician in the steampunk community. I first heard Coyote Run while at Wicked Faire, but didn’t have a chance to see their full set until Steampunk World ‘s Fair. My friend Max had practically leaped out of the hallway where we had been talking, exclaiming, “I have to go Coyote Run is playing–!” My friend in question tends to be very enthused about a lot of things, and from what I had gathered from him before his sudden dash was that Coyote Run was one of the best gypsypunk bands he had ever seen and so it was absolutely imperative that I go see them too. I watched their set and was quite impressed with their crackling energy and great sense of showmanship. And, surprisingly enough, I also found out that they don’t identify themselves as steampunk, or even as gypsypunk, but as a Celtic rock band. That in itself is very interesting, considering the variety of international instruments they play and the range of genres they incorporate into their music. For some examples of the type of tunes they play, I recommend checking out their YouTube videos Whalesong and But For Blood. Afterward, I got in touch with Coyote Run’s lead singer David Doersch to talk about their versatile sound. 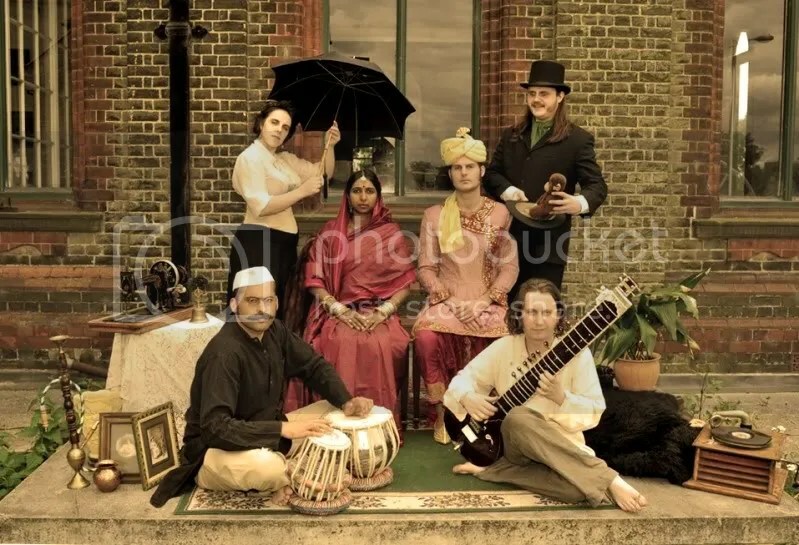 Steampunk music comes in various interpretations and styles, from Rasputina’s lilting southern gothic to Sunday Driver’s Indian-infused world folk and Vernian Process’s melodic steamwave instrumentals. 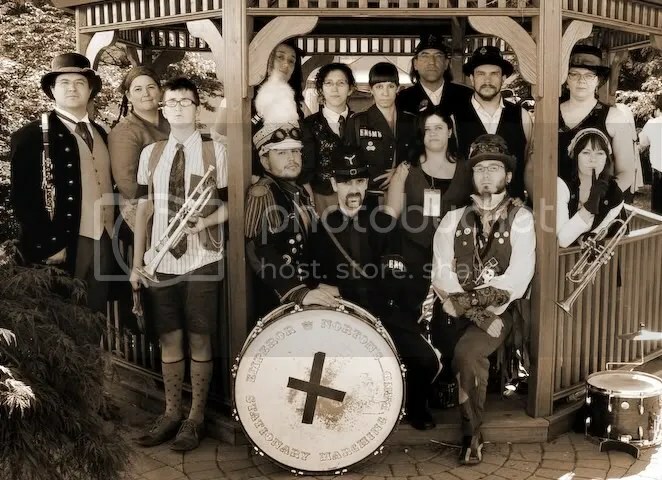 But few bands can embody steampunk’s post-modernist mix of eclectic, rip-roaring energy as the ladies and gentlemen that make up Emperor Norton’s Stationary Marching Band. Today being the Fourth of July, the US holiday marked by parades, parties, and fireworks, I thought it was only apt to feature some big, incendiary music on the blog, and ENSMB is as big as steampunk bands can get. Before passing from this plane in 1880, Emperor Norton, I, revealed to his followers that he was no ordinary mortal man, but instead a manifestation of the absurd and unusual forces of the universe. He offered them the chance to follow him on his crusade to unsettle and disturb that which had become bland and banal. A grand parade ensued and continues on through time and space, bringing in its wake a glorious commotion that encourages all to join in the jubilation and make of this world what they will. ENSMB is the progeny of this bizarre cavalcade. They dance at the edge of reason, sing the song of society’s fringe and drum out whatever din you are called to march to. 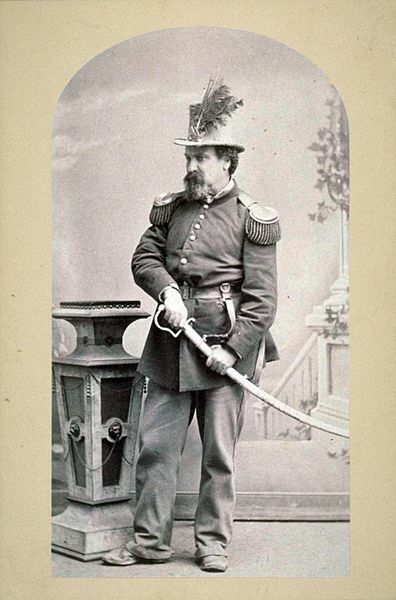 Emperor Norton is not dead; he is waiting to be awakened in each of us. Saxophonist and ringleader Handsome Chuck (the gent in the bowler and spiffin’ side-whiskers in the first row, right-hand side in the above picture) offered some insights into the workings of steampunk’s most mobile musical group. Carnival Catalyst over at The Steampunk Empire first brought my attention to Sunday Driver, and later that same day, I read Libby Bulloff’s glowing praise for their work and smelled a snowball effect coming on. And, boy, do I like making snowballs. So I checked out their site and brought In the City of Dreadful Night from iTunes to hear for myself and was blown away. From the fusion spin on traditional Indian chant in “The Gayatri Mantra” to the smooth-to-edgy variations in “Heroes” to her darkly whimsical jazz croon of “Rats,” lead singer Chandrika “Chandy” Nath gives a strong and varied performance on this album, with strong instrumental support from band members Joel (Guitar & Sitar), Kat Arney (Harp, Clarinet(s),Spoons), Matthew Sarkar (Tabla – though recently Rahul Ghosh has taken his place), Melon (Bass), Chemise (Guitar), and Scot Jowett (Drums). Recently, I had the pleasure of talking with Chandy—with the occasional pop-in answer from Joel—about their music, their band, and their views on steampunk.